IPPA is proud to introduce its first "International Spring School on Public Policy - Denver 2018" . 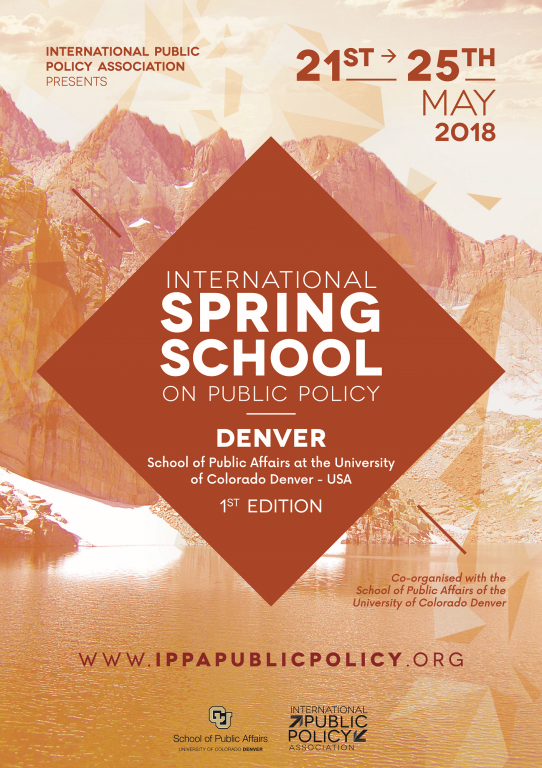 Co-organised by IPPA and School of Public Affairs, University of Colorado Denver, the Spring School will be held in Denver on May 21-May 25, 2018. Grants are addressed to students who need it to come to Denver. This grant can cover up to 70% of the registration fees (410$ out of the 550$) and consist to obtain a discount of the registration fees. The field of public policy involves multiple approaches and techniques used to understand, explain, and inform policy processes in an increasingly globalized field. One 2-hour grand challenges roundtable session featuring the international scholars featuring the international scholars on how to better position public policy scholarship to better address the grand challenges facing humanity (e.g., climate change, refugees and migration, inequity and equality, political sustainability of our governing systems).